Is the World ready for Global Justice? 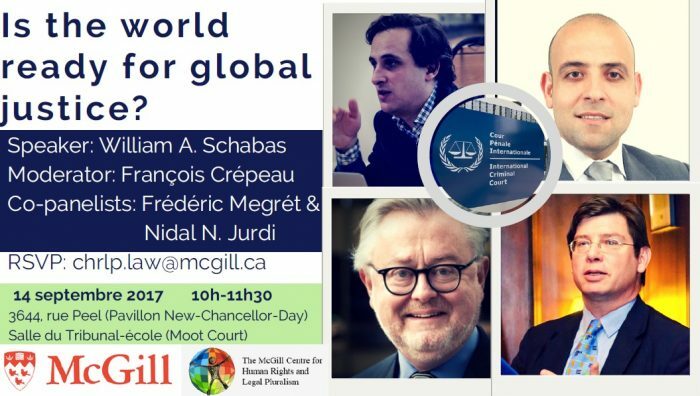 The McGill Center for Human Rights and Legal Pluralism hereby invites you to its big conference of William A. Schabas moderated by François Crépeau and followed by a discussion with Frédéric Mégret and Nidal N. Jurdi. As you know, 2017 is a very pivotal year for international criminal justice. It marks the 72nd anniversary of the establishment of the Nuremberg Military Tribunals, the 71st anniversary of the establishment of military tribunals in the Far East, a special year for the United Nations ad hoc tribunals in the former Yugoslavia and Rwanda both of which are in a gradual completion of their respective mandates and without forgetting the anniversary of the entry into force of the Rome Statute of the International Criminal Court. 15 years after the establishment of this judicial institution as a permanent body with a universal vocation operating under the new premise of complementarity to national jurisdictions, this tribunal is now at a crossroads: high-level state officials accused for having committed grave crimes continue to travel around the world, key witnesses are assassinated, charges have been dropped by the office of the prosecutor itself, preliminary examinations stagnate whenever the most powerful are concerned. In Syria, as well as in every situation where nationals of the permanent members of the Security Council or their allies are concerned, it is a total inactivity. Even where the judicial system seems to be moving forward, the immunities of heads of state on the one hand and, most seriously, immunities for heads of non-state parties on the other hand, have come to poison the procedure. On the African side, some states start slamming the door of the Court while building a relatively parallel system at a regional level. Place: McGill Law Faculty, Moot Court Room. Postal Address: 3644, Peel Street (New-Chancellor-Day Hall), Montreal, Canada. You can find the event description also on Facebook.